Texas Hill Country "soil" - if you wanna call it that - is well known for its rocky constitution. Spouse and I thought we could bypass some of the effort of digging out holes for the new trees by renting a hydraulic post-hole digger. We could drill a couple of holes in tight relation to each other, scoop out the original soil, put in the good stuff ($31.00 a cubic yard - ouch! ), then plop the tree in. Here's Spouse on the digger - looks like it could do the job, right? Here's what the soil looked like, barely a foot into the dig. 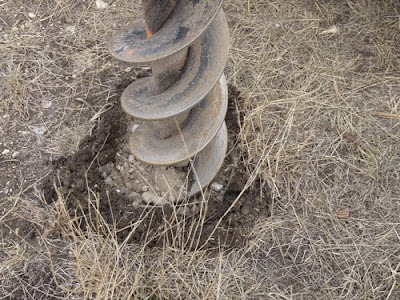 Where the post-hole digger's progress was stopped cold. Notice how the darker soil gives way to rocks? 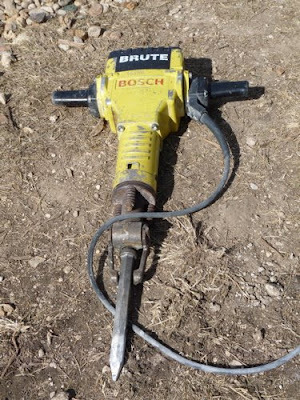 Below is what a jackhammer looks like. This is what I ran into town to get after the post-hole digger stopped. Here's a tip on using a jackhammer: don't press the weight of your upper-body onto the top of the jackhammer to put more pressure on the hammering. It will rattle your skull like a baby with a shaker toy. Note to self: It's okay to let the jackhammer do the work, honest! We planted both apricot trees fairly close to the house. Apricots do well with a bit of sheltering, and they're in a good space - not too much Winter north wind (blocked by the house), and not too much Summer south-east wind (broken by the cedars). The trees will also provide some much needed shade for our side yard, which will be enjoyed by critters and humans alike. 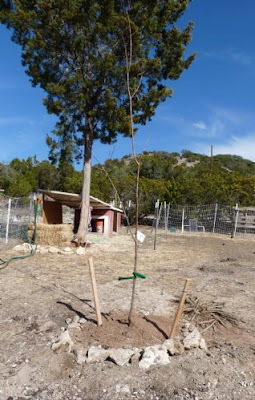 Further down the hill, we planted two plum trees (different types for cross-pollination) and the two pomegranates that had been waiting for transplant since, oh, May? Two more holes were dug: one for the third fruiting cactus, and the other for the third fig. Spouse later took the post-hole digger down to the big flat area of the property where the bulk of the orchard will end up being planted. He was able to dig a whoppin' six inches deep in some areas, and only up to a foot in others - again, rock. 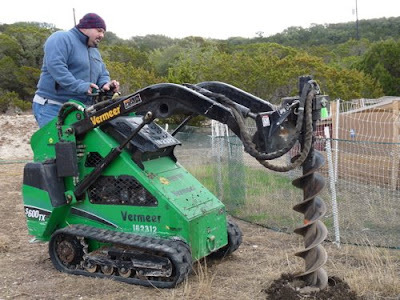 Next weekend's digging strategy: skip the post-hole digger/jackhammer combination, and rent a 48" trencher instead. We'll be ordering another truckload of soil, and planting more trees as we can afford to bring them in. It'll be a variety of fruits and nuts. I've discovered the term for the type of farming I want to do: Market Farming. But this post has gone on long enough... more on that later. So Texas Hill Country music = Good and THC soil = Not So Good?? Oh, you had a fun weekend! Fascinating reading for dirt geeks. @S_Vandemore: thanks for the nursery link! Very nice! @thecottonwife: nobody around here hand digs holes. Nobody. People know you're new when they see someone hand digging a hole :-D.
@Dave: Spouse's grandma crocheted that hat for him. He loves it. A man who is not afraid to wear purple! Man, I thought Spouse learned his lesson back in VA when we tried to put fenceposts in @ Beagle Manor. Power auger? Forgettaboutit. Jackhammer city. "Do you want the clay spade with that?" Naw, man, just the concrete tip will be fine. Hydraulics are the kind of tool that's wiser to rent than buy. Compared with owning one, renting will save you from upkeep and storage cost, tax, license and fee reductions. It will also let you use more updated and advanced technology. "Can't They Do That At The Vet?" Food Storage Class - follow along!